Drone photography has different challenges than grounded photography. If you are interested in a class in video format, Bruce Geddes through Udemy has a Drone Photography & Video Course, currently available for $25 through StackCommerce (formerly known as StackSocial – the “social” hype is wearing off!). All sales final. Instant digital redemption. This is video course available for Web and/or Mobile video-streaming. Lifetime access. You must redeem this promotion within 30 days after purchasing. CreativeLIVE is having a FREE online conference running between September 18-25 in 2015. A variety of classes are planned. You can see the schedule by day over there. This offer expires soon (unless renewed), so it can’t wait for the upcoming round-up. At Stacksocial, you can get the Photoshop 2-Course Bundle by GoSkills for $39. This provides 12 months of streaming access to the courses. Internet access is required to watch the courses. Instant redemption. All sales final. 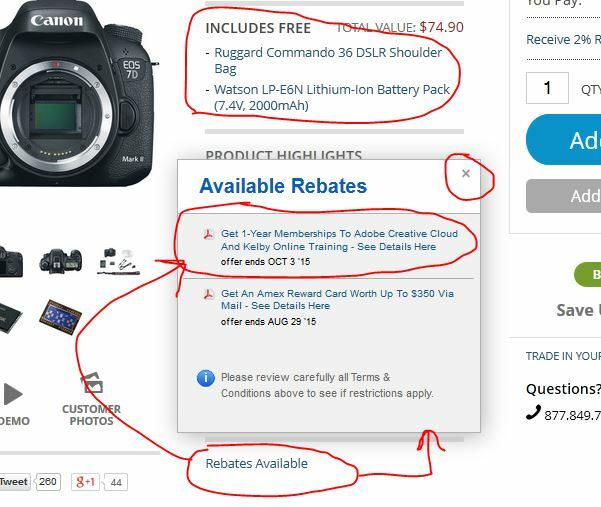 If you are planning to get the Canon 5D Mark III, or 6D Mark I, or 7D Mark II, there is a new (stackable with other offers) promotion at B&H Photo that gets you one year of free Adobe Creative Cloud Photography (Photoshop CC and Lightroom CC, not everything in the Creative Cloud), along with one year access to the Kelby One online training courses for Photoshop CC and Lightroom CC. This offer is stackable with any other offers available, whether they are free accessories or prepaid Pixma mailin rebate offers or promotional rewards or anything else. UPDATE: this bundle is also offered through Stacksocial.com. Good until June 25 in 2015, B&H Photo is offering an electronic download bundle for $100, the The Big Deal Photo Software Education & Membership Bundle. This is delivered electronically, 1-3 business days after purchase. It includes a variety of training courses (100 hours of videos), eBooks (12 of them), presets and actions (836) and one-year memberships (six of them). A lot of familiar names are participating, Kelby, Ziser, EyeFi, Sammon, and more. This was just launched, so there are no customer reviews of it yet. On the training front, Stacksocial has a Train Simple Creative Cloud Mastery Bundle for $50. It includes eight courses that include a Photoshop CC Fundamentals course. This comes with lifetime access to the online courses with instant redemption but all sales are final. Elsewhere at Stacksocial, their Summer Mac Essentials Bundle features nine software titles for $20, including the Noiseless app by MacPhun that as the name suggests, tackles image noise. The other eight are utilitarian utilities of potential Mac interest. This is a digital download, all sales final, resale of licenses not allowed. And on the “pay what you want front”, if you meet or beat the average price (currently $6.38), you can get a Mobile-First Developer’s Bundle that features 10 courses with a 70+ hour runtime covering HTML5, Swift (Apple’s now open-sourced language), Lollipop, WordPress, iOS8, and more). Digital redemption, all sales final, lifetime access. Compatibility varies by item, so check the individual listings there if you are interested in something specific. On the online front, there’s a lifetime subscription to VPN Unlimited for $40 (up to five devices activated, updates included). And if you have gone down the WordPress Theme rapid rabid rabbit hole like I have, they offer a variety of WordPress Theme bundles, including a “pay what you want” bundle. Stacksocial has launched a new Adobe Photoshop CC Training Bundle from Train Simple offered for $55. This bundle contains eight different courses. It offers instant digital redemption. It comes with a 30-day money back guarantee. At Stacksocial, there is a DSLR Photography Course Bundle by Ken Schultz on sale for $25. This offers unlimited online access to the courses and instant redemption. No refunds. Seven is the magic number at Stacksocial, they are offering a Photographer Seven Course Bundle for $49. The seven courses are from six different Udemy instructors: DSLR, HDR, iPhone, Black and White, Portraiture, Travel and Photo Restoration. Click on the “Read More” of each course to see more details. They offer unlimited access to the courses once purchased. This offer has a 30-day money back guarantee. More action at Stacksocial, this time Udemy is offering a seven course Videographer bundle for $39. The seven courses cover general topics and software specific topics. You can find a detailed list of the courses and their contents over there. Note that all sales are final for this offer. Once purchased, the courses are access through Udemy. Stacksocial is offering this Ken Schultz Digital Photography Video Course bundle for $25. It includes two courses, a Beginner’s and an Advanced course, with a total run time of 10 hours. This offers unlimited online access to the courses for this one-time fee. This offer includes a 15-day money back guarantee if it does not turn out to your liking. A couple of sample videos from the course are embedded at the aforelinked page (click on the “Read More” gray buttons to reveal them. Stackosocial is offering this bundle of over 5,000 Adobe Training Videos with lifetime access for $79. The bundle is offered by “Train Simple”. No refunds. You must redeem within 60 days after purchase. To access the videos, per the page over there, Web browser, Flash Player, iOS device, or Android device is needed. Please note this covers all Adobe products, not just Photoshop/Lightroom. This offer ended… Ending by 3am ET on Sunday 11/2/14, the Bonus Gold Box deal du jour at Amazonia is the Cosmos Documentary Series with Neil deGrasse Tyson. The BluRay goes for $22.50 while the DVD set goes for $20. Lots of astrophotography and digital imaging of all sorts. Needless to say, this is something you can watch and rewatch and rewatch and learn more each time. Speaking of Stacksocial, if you are looking to host a blog/website/etc, they are offering one year of JustHost web hosting for $30 total. This gets you 12 months of service. JustHost offers only one shared web hosting plan, so it can’t scale up if you are planning to produce viral content and such. The usual caveats of using shared web hosting apply. AmazonLocal is offering online photography courses from DSLR Pro Academy in this fashion: each course is good for 12 months, it does not have lifetime access. They have two courses for $29 each: “Basic DSLR Photography” and “Advanced DSLR Photography”. Or for $39 you can buy both. Again, keep in mind, you only have 12 months with these courses, not lifetime access. Check the terms/conditions for all the details before buying.